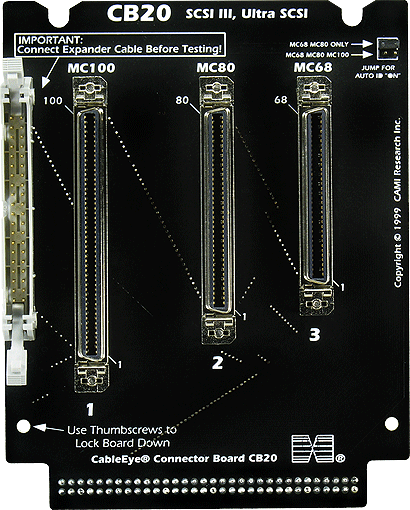 Three mini-Centronics-style connectors in sizes of 68 pins, 80 pins, and 100 pins permit testing of fast-wide SCSI cables or other types using these connectors. Requires 256 test points! Bare board available for other large-format connectors that fit the 4-row staggered-pin footprint of these connectors; contact us for details and pricing for the bare board version. Set of two boards with expander cable.